Samsung in its MWC conference mainly focussed on the Tab S3 leaving out the most awaited Galaxy flagship, the Galaxy S8 and S8+. But now as it has arrived, it’s taking the market by a storm and taking the limelight off the iPhone 7 and 7 Plus. The design of the S8, makes all its competitors look shy and feel ugly about themselves, even the Galaxy S7. It is simply elegant and stunning. This year Samsung has brought the Edge Screen feature to both the S8 and S8+so you need not spend that extra 90$ to get that feature. Speaking of the size, it is almost similar to its predecessor with the S8 being slightly taller by 0.7 inch. The phone feels great in hand and seems very easy to handle too. With a screen-to-body ratio of over 83 percent, it is one of the best piece of craftsmanship totally owing to the reduced bezels at the top and bottom. The physical keys are off the list this time and are replaced with in-screen pressure sensitive buttons. This does seem a good improvement. The phone also has a new button to the side, aimed for quickly launching the Bixby Assistant. Samsung has given their best till date in making the best phone around and has made it even better with an impressive screen and design. The fingerprint scanner, unlike the previous models, is now on the rear but surprisingly placed next to the camera. Quite awkward eh?! It can be said to be just on flaw in the whole design, as it makes it quite difficult for the right-handed users who will end up smudging the camera most of the time. The Galaxy S8 is has a lot of glass and metal making its body yet again making the grip a little slippery but fortunately the makers have used a Gorilla Glass 5 back to resist damage. Though, you might wanna consider getting a case to protect this expensive metal and glass piece. The phone sticks to the Samsung usual SUPER AMOLED display technology that ensures great contrast and colours coupled with the 2960×1440 resolution. A pixel density of 570 PPI is enough for anyone. A notable feature this time is that it has Mobile HDR Premium certification which means that it has the ability to display HDR content. Sounds good eh?! But it’s onlyavailable with certain titles exclusively on Amazon Prime Video at the moment. Samsung, as all expected, has have put the firm’s new Exynos 9 8895 chip, replacing the idea of the Qualcomm Snapdragon 835, which the two companies collaborated on. This latest octa-core processor has clock speeds of 2.3- and 1.7GHz (four cores each) and to increase the performance bar, it is coupled with a Mali-G71 MP20 GPU. This makes the phone one hell of a beast and increases the performance bar to a new height. Gaming is really smooth, even the heaviest of the games and multi-tasking has never been more buttery soft. ONE HELL OF A JOB FROM SAMSUNG!! The Galaxy S8 still has 4GB of RAM and arrives with the usual 64GB of storage front. There’s a 6/128GB model but available only to the Asian market. It has the usual expandable storage upto 256GB. As mentioned already, the fingerprint scanner has moved to the back in order to fit a much larger screen. Samsung has aimed at making the product look symmetrical and has decided to compromise a bit with the comfort here. The firm says you won’t need the fingerprint scanner as much because of the improved Iris scanner. It hasn’t changed a bit from the era of Galaxy S7. The Galaxy S8 has a 12Mp Dual Pixel with an interesting f/1.7 aperture coupled with other features like optical image stabilisation and 4K recording. The camera does ‘multi-frame image processing’ where it takes three shots instead of one and uses the extras to do things like reduce blur and perfect other elements like focus. It is just the new processor which makes the snaps unbelievably good without need of editing them. There are tons of different filters and shooting modes to experiment with. To add to the list, there is even a new food mode for showing off the restaurant orders and some delicious home recipes. It hasn’t changed either this time. Samsung Galaxy S8, yet again, features a 3000MAh battery but does provide it with USB Type-C port with supported fast charging and wireless charging option. The company claims it to charge to about 20% in 15min. As expected, the phone comes preloaded with the latest version of Android i.e. 7.0 Nougat. The interface seems pretty clean and easy to use but still surprises behind the scenes. There are a lot of preinstalled apps but most are useful. There are tonnes of things you can customise with the software including things like the home screen. There are a plethora of options in the settings menu and you might get lost in it. An example of this is the fingerprint sensor gestures which are switched off by default. 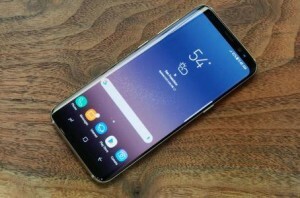 The navigation buttons are on-screen you can swap back and recent apps around and this time round Samsung has added the pressure sensitive feature to them. The main contrasting feature this time in the software part is the addition of Samsung’s own exclusive personal assistant Bixby. Samsung has given their best till date in making the best phone around and has made it even better with an impressive screen and design. It does check off a lot of boxes for the features you wanna see in a flagship device. It’s the best phone of 2017 so far but it is expensive side. 10 Smart ways to use your Smartphone Camera ! !